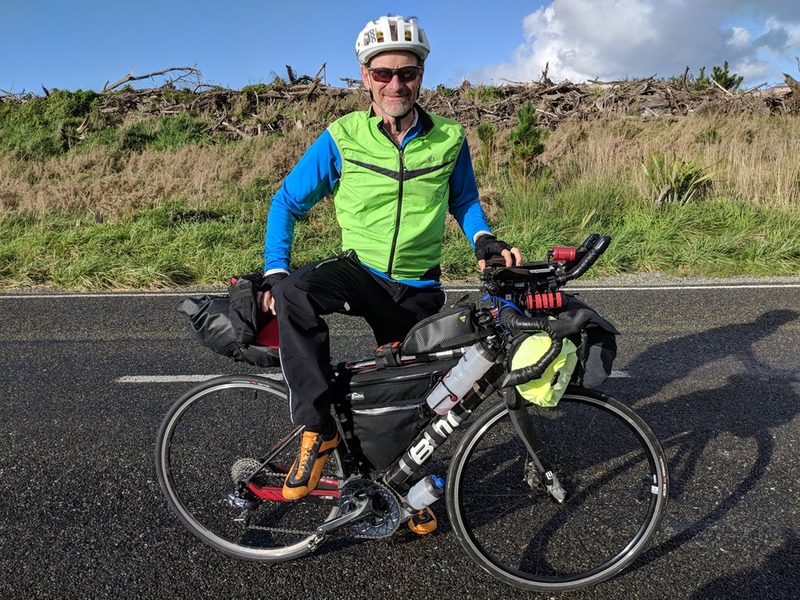 Andy Buchs—who I met at last year’s Indian Pacific Wheel Race across Australia had the idea for a race from the northernmost part of Europe in Norway, to the southernmost in Spain: the North Cape-Tarifa (NCT) race. Sounded like quite the adventure so I signed up and we start the inaugural race at midnight on 20 June. I’ve just been sent the final route and it’s a bit more than I expected: 7,389 km with 85,000 metres of climbing. Ouch. I’m prepared as best as I can be all things considered, but will be interesting to see how things go! 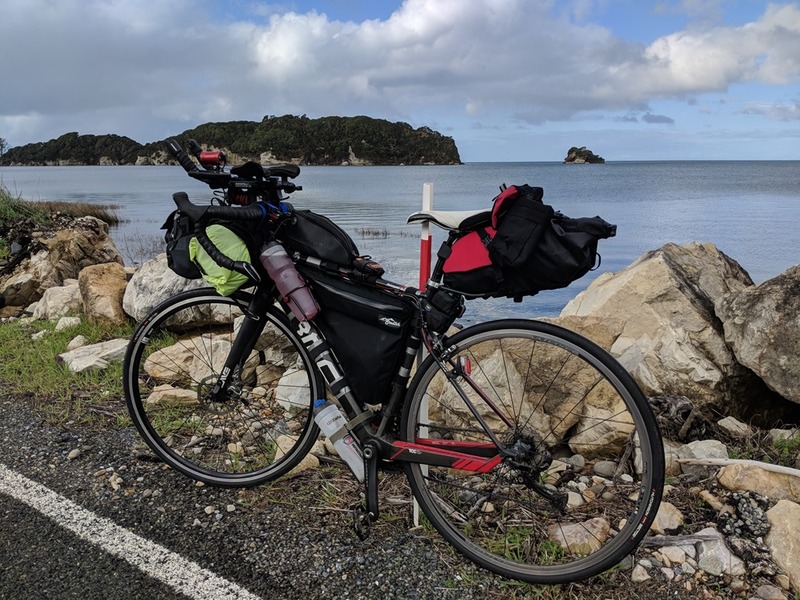 I had an extended time off the bike after my major crash in the Tour Aotearoa in February. At least for me. I didn’t ride for two weeks and then spent six more weeks just on my trainer. Not good if you have another crash while recovering from a concussion! The recovery for which took longer than I hoped, but I’m a lot better now. Knowing that I’d have a big ride ahead of me, I adopted an aggressive training program using Xert to manage it. This meant each week about two hours each day on the bike, along with a couple of long rides of 4+ hours. Due to my heavy work and travel demands that meant on the bike around 05:00 most days, and after a few months I’m fit, but really tired. So starting my taper a bit early. Xert says that I’m in a good shape so hopefully I’ll be OK fitness wise. I’ve still a few legacy issues from the February crash, but hopefully they won’t be a problem. Using a Sinewave Beacon for the light and USB power. Must be better than my B&M Luxos U which stopped working due to heavy rain. I’ve a Lupine Pico as a backup light with a 6000 mAh battery. The latter also is a backup USB supply should I need it. Using Schwalbe One Pro tyres, tubeless as long as my Maker wheels let me. Unfortunately, they are problematic when it comes to running tubeless. I’ve gone to the new Finish Line sealant. We’ll see how it works. 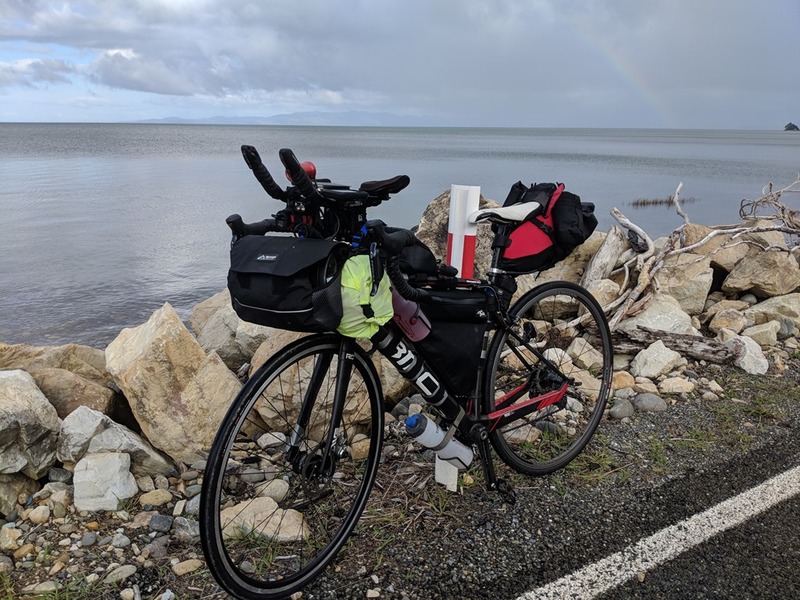 A few clothing changes: Pactimo Stratos bib shorts as I had a few issues with my Exocets on the Tour Aotearoa; using an Showerspass IMBA rain jacket; and an Eddie Bauer DWR down jacket. Swapped out my home made Di2 aerobar shifters for proper ones from Shimano. After breaking my carbon bars in the IPWR aluminium handlebars of course. I’m running Absoluteclack oval chain rings. I love them. My gear list is at the end, along with where I store it. A few photos of the kit is below. The weight of everything is almost exactly 6 kg. Would be 4 kg if I did not take the bivy/matt/sleeping bag. For bags, I have a new custom made Stealth frame bag. This has three compartments. I got Dave to put velcro on the inside of the top compartment. This holds my pump. I modified the Porcelain Rocket frame with two feed bags on the outside, and a mesh compartment on the top. Also cable tied my spare tire to the bottom. My downtube parts bag only contains water impervious things as even though it is waterproof it still leaked last time! I’ve an Alpamayo harness and handlebar bag, with an Alpkit 13 litre Airlok duo dry bag. My gastank bag is from Topeak. Here is the bike fully kitted out except for my Wheelworks Maker race wheels. There are 3 x 1 Litre Magnum bottles on the frame; I have two more light weight 1 L bottles folded up for when I need to carry more. The top two bottles use a special NZ made frame which I modified to load them higher up and out of the way. Here is a shot of my cockpit. The blue button on the left controls the Lupine Pico which is mounted beneath the red Sinewave light. I made the bracket for the lights by using Profile Design bridge mount clips with a longer plastic bridge. 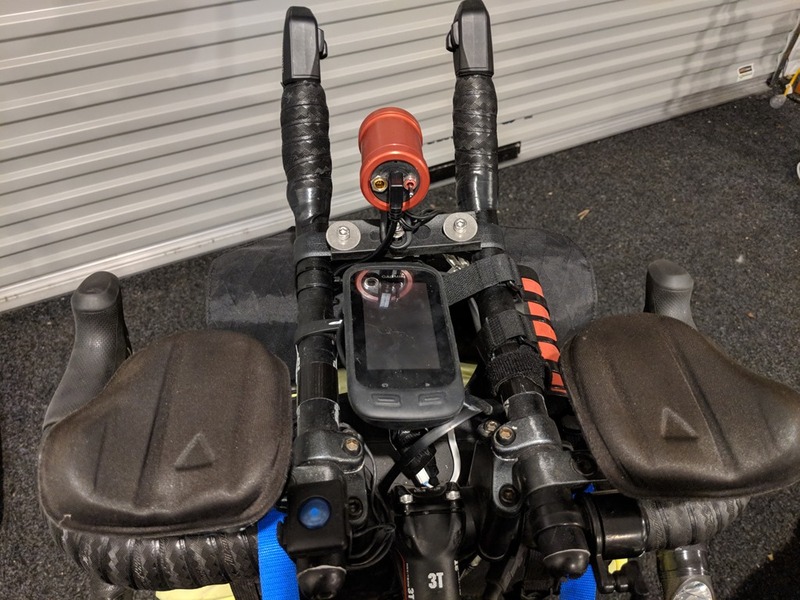 On the right under the aero bars is the OT Buckshot Bluetooth speaker and USB power bank. I’m using my Garmin 1000 again. I had hoped to use my new Karoo as a backup, but it’s not able to load routes so not viable. Every race I’ve had my 1000 pack up on me so need a backup. This time I’m using my old Sony Z3 Experia which I will run Strava on to record the daily travel should (when?) it fails this trip. My backup navigation is OSMand+ which is great. 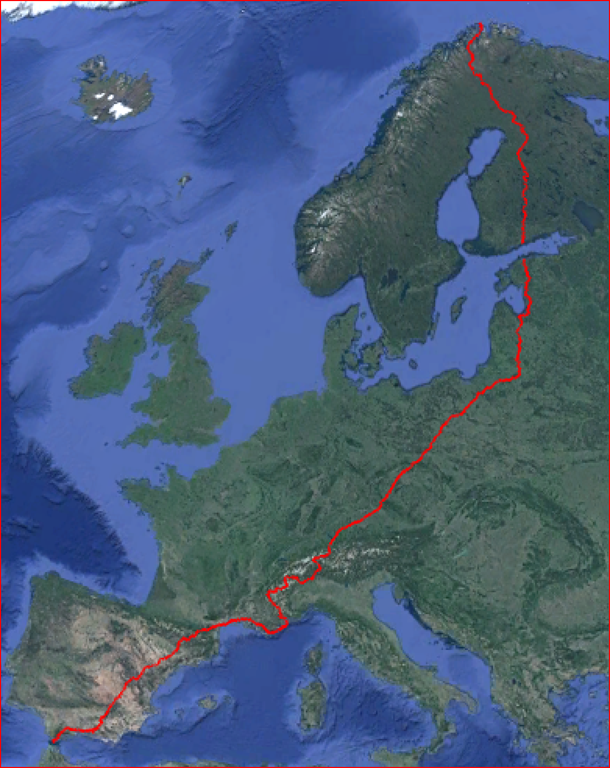 I’ve downloaded all the maps of Europe to it and it displays not only the route but also POIs. Here’s a great guide to using it. I’m also using an app I’ve had written ‘GPX-POI’ which loa ds in all the POIs ahead of you on the route and tells you how far to the next one. The screen shot to the right shows how far away POIs in Poland are—from Golden Bay! The other app which I’ll be using is ‘Epic Ride Weather’ which takes the GPX route and tells you what to expect over the next distances as you cycle with regard to rain and wind (both speed and direction). I’ve given it a review here. Absolutely essential. Technology is great, but as a backup I’ve made a set of cue cards which list the supply places along the route. These are laminated and I tape to the back of my phone so I can glance and see what’s ahead. We will be using www.mapprogress.com for our tracking. I’m also always showing on my personal SPOT page—at least once the race starts! This will be my last endurance bike race until I take a sabbatical or retire. The demands of work at the World Bank are increasing, and juggling that with our family time and training is proving too much. So probably a return to triathlon next year, unless I get smart and move on sooner than planned! It’s been a challenging year so far, and I’m really looking forward to the adventure. Hopefully meeting Lis in Bolzano 4+ weeks after I start for some hiking in the Italian alps. Hiking for her. I’ll be sleeping and eating! Shorts for sleeping in/wearing during laundry, etc. Hi Chris, and thanks for all your writing — it is very informative. Sorry about your experience in TA ’18 — I also had to pull out, but nothing as dramatic as your experience I think. I’m looking at getting a new backup battery, and one I can charge from my dynamo hub (via a Plug III), and use as a passthrough. Do you have any favourites or thoughts? Hi John. Glad you found it of use. My main advice would be to ditch the Plug III! Two failed on me and they’ve a really poor record on the Tour Divide. If you must go for a top cap solution the Sinewave is the most reliable. For batteries, the key is to have a pass through charge. If you look for solar power companies they have good ones. What I found worked best for me was to have 2 x 6000 mAh batteries and not to worry so much about the USB charging from the dynamo. Used it to run my light and UPS with the 6000 mAh (Limefuel) for the phone. Just be sure to take a charger that will plug into the wall and do more than one at a time (or a USB splitter).